Descended from the Attacker via the first swept wing British jet, the type 510, the Swift was the RAF's first swept wing fighter. The type suffered from a protracted development, further exacerbated by labor and material shortages in austere post-war England. Attempts to speed production of this and other aircraft through legislation (super-priority) may have raised production rates marginally, but did little to cure the types problematic high altitude idiosyncrasies. In any event, the Hunter, which shared many of the Swifts woe's, proved the more equal animal. Much maligned, the Swift was relegated to low-level tactical reconnaissance. Once pilots got 'round the types reputation, the aircraft was found to be a superb low altitude recce platform, fast, strong and maneuverable, winning NATO tactical reconnaissance competition in the late 50's, as well as finding use in other 'OBJ's for the air staff- like photographing golf courses! Kazunori Ito's sweet F-86D in FSX standard MDLX. The F-86D was a night and all-weather interceptor development of the F-86. First flying in 1949, The D was radar and afterburner equipped, armed only with a battery of 2.75 inch FFAR's. The machine had only 25% commonality with the diurnal Sabers, and was briefly called the YF-95. 6 different models were produced by North American and Fiat, equipping 18 air forces around the world between 1949 and the 1970's. This important and over looked type has been beautifully modeled by FS master Kazunori Ito some years ago. Most of the FSX conversion work was done by Henk, with some corrections and the VC converted by Y.T. The gorgeous textures really transform this little gem, these are lovingly created by L'Iguane and Manuele Villa, based on SF8/Jan Visser's metal textures, adapted by L'Iguane. Alphasim Vickers Valiant in MDLX standard, for FSX only The often overlooked Valiant was ordered as 'insurance' against more advanced Vulcan and Victor. Designed and developed very quickly, the Valiant's were delivered on time and on budget, a rarity in military aircraft development. B.1's dropped live H-bombs on tests out of Christmas island, dropped conventional warloads on Egyptian airfields from Cyprus during the '56 Suez war, provided NATO's nuclear punch, and served as AAR tankers. Cockpit/interior model is from the Simshed 2010 Nimrod, see readme for instructions. Model by Alphasim(virtavia) http://www.virtavia.com, with Phil's kind permission and encouragement. 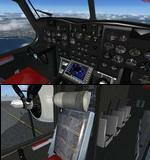 Sensi Ito's Convair XF2Y SeaDart, for FSX only. Conversion to FSX native material and animation definitions. One happy side-effect of this is the model now has impeccable sea manners. Cockpit aliased to the FSX native CF-105 Arrow, installation of which is required for the VC to display. See readme file. Also includes some AICarriers2 toys handy for sea-basing operations and seaplane fun. FSX native conversion of the full original Alphasim CF-100 Clunk with VC. All functions and animations correct in sense and direction, per original FS9 release. MDLX interior and exterior models and materials, file structure. Made possible with the support and encouragement of Phil at Virtavia http://www.virtavia.com, and their old ex-payware library made graciously available. For FSX acceleration. FSX/P3d TDS Boeing 737-700 C-40 B/C USAF Package with Enhanced VC and HUD. The C-40 B/C is based upon the commercial Boeing 737-700 Business Jet. The body of the C-40 is identical to that of the Boeing 737- 700, but has winglets. Both models have state of the art avionics equipment, integrated GPS and flight management system/electronic flight instrument system and a heads up display. Model by TDS/ Tenkuu Developers Studio with advanced 737-800 VC added. Includes utility for ground services, Passenger bus, cargo, stairs, refuelling truck etc (find it under - Views - Instrument panel - Util) The wonderful new Boeing 737-700 from TDS will be enjoyed by many more people who do not know how to install a VC into a FSX native model. The VC is the Alejandro Rojas Lucena/FSND fantastic revised Boeing 737-800 VC model. This VC model includes Working wipers (right mouse click on switch) with rain effect. Switches for LCD Screens, EICAS, PFD, MFT. Autobrake switch. Opening pilots window. Cabin Lights switch. Realistic FMC. Ground Proximity Warning System (GPWS), More Realistic night VC textures. There are custom Boeing sounds included for that extra realism. I have used the textures by Favour Kalu. Included the HUD and TCAS included in the recent Robert Taylor CRJ700. (find it under - Views - Instrument panel - Hgs & TCAS)) Model is not modified in any way. VC added and aircraft.cfg edited to allow correct VC views. TDS wonderful native FSX Boeing 737-700 model. See VC docs to get the best out of the VC and FMC. Zip preview for bigger images. Assembled and prepared for FSX by Chris Evans.